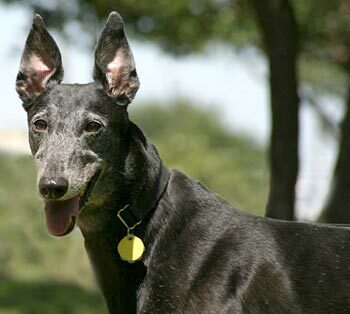 Maya, formerly Inky, aka Jewell Walker, is a friendly, 6-year-old black female born March 11, 2003. 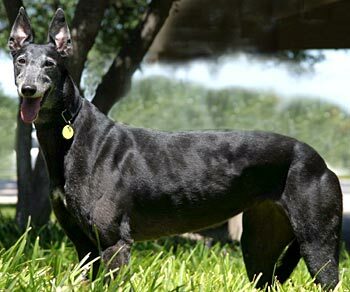 Her sire is the late Gable Dodge, making her grand sire Wigwam Wag, and her sire is Mary Kay Walker, making her grandsire Molotov. What a lineage! 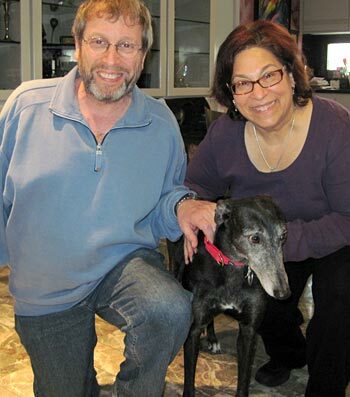 Maya was adopted and in a home over 2 years with another greyhound. However, the family situation changed, and Maya is now looking for her forever home through no fault of her own. Originally, Maya was found running loose as a stray in Farmers Branch. At this time it was determined that Maya had suffered previous trauma to her right front ankle. Current x-rays show the beginning of some arthritis, however Maya is in no pain. 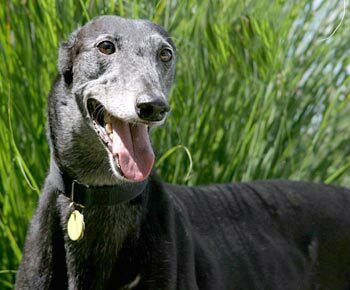 Greyhound-Data.com shows Maya's racing history starting September 23, 2004, at Gulf Greyhound Park, where she stayed until August 2006, moving then to Mobile, AL. where she ran her last race on September 8, 2006. Maya has a cute salt-and-pepper colored face, with a few extra gray hairs earned from life on the road. Maya is cat and small animal tolerant. Maya is the dog you envision when you think of a dog by your side -- loyal, true and "hopelessly devoted to you!" Being Maya means that even at age 6 -- nearly 7 -- you are full of energy, drive and competitive spirit -- and you are all about maintaining a truly heart-healthy pace of walking. Maya does not especially play with toys, although she has picked up a "favorite" from time to time. She does love to eat! Interestingly, yogurt and fruit are not among her favorites. She has learned quickly the routine of this foster home, and she looks forward with eagerness to morning walks. Long walks do not seem to bother her previously broken leg. Maya has a stunning salt-and-pepper face, complemented by her "model-worthy' salt-and-pepper legs. Other than those features, she is a brilliant shiny black. She is the girl who always wants to be where you are -- who has never met a stranger -- and, in fact, will reward complete strangers with that patented greyhound lean. Just with her presence, Maya makes you feel "greytful" that you have her around. When you see her, watch out for your heart - because she will grab it with all four paws and not let go until you have decided you can't live without her! Maya with her new family!